Navigate to Small Groups > Roles and select the Add role button in the top left corner. Enter the Name of the role - e.g. Leader, Worship Leader, Attendance Submitter, Prayer Coordinator, Flyer Contact, Co-Leader. Next, select which additional options and My ChurchSuite permissions are to be granted for group members who are assigned this role in their group. See later in this articles for an explanation of each option and permission. Click to Save before navigating away from the page. Helpful icons give you an 'at a glance' view of the Options and My ChurchSuite permissions you have assigned for each role. Hover your cursor over an Option or My ChurchSuite permissions to see what the option is. You can return to the Roles list at any time to make changes. Note also how you can easily Reorder small group roles using the up/down icons. Simply click and drag a role within the list, or click to open the Reorder modal and use the up/down icons to make changes as appropriate. Remember to click Save Changes. Having created a role, you now need to assign that role to specific group members in each of your small groups. To do this, navigate to Groups list within the Small Groups module. For each group in turn, click View from the action cog on the right hand side. On the group page, scroll down to the Members section. To assign a role(s) to a group member, select Edit from the action cog next to the member's name. Simply search for a person, select their Roles from the drop-down list, and save the changes by clicking Add Member. 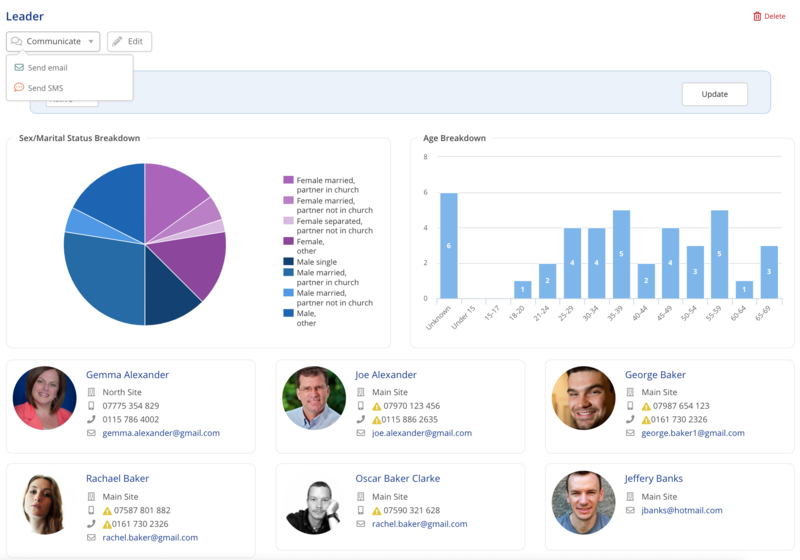 When creating a Role you can choose whether additional functionality and permissions should be granted to those assigned with that role. To grant those in that role these additional functions and permissions simply ensure that the relevant option is ticked. These permissions extend to the groups in which one or more group members hold that role; but they don't extend to their other groups where they may be members without a role. Each of these role options is now explained below. When enabled, group members with this role will have their contact phone number and email address displayed on the printed flyers for their Small Group. Note that only one person's details can appear on flyers, so make sure only one person per group has this role. To help with this, you may find it helpful to create a role called "Flyer Contacts" and then assign it to just one member in each small group. For guidance on how to print flyers for small groups, check out the related article section below. Please Note: In order for a contact's details to be visible on your flyers you'll need to check that both email and mobile are set as visible in the member's Address Book profile page in the Privacy settings. You may need to seek permission to change their privacy settings to display on flyers, or select a different member who is happy for their contact details to be shared in this way. The order of preference is that a mobile number is displayed - if the contact doesn't have one in the Address Book, their telephone number is used. It is not possible to specify which number is used - the order is simply mobile, and if not present, telephone. 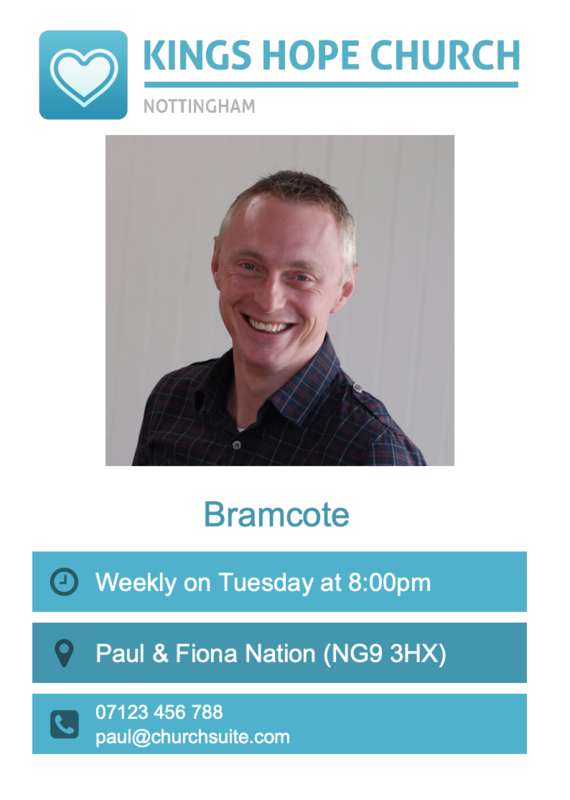 If you simply want a mobile number on your flyers, you can go to the member's contact page in the Address Book and temporarily turn off their Email is visible for their privacy settings. You can then print the flyers with just the mobile number, and then return to the Address Book and revert their privacy settings. The same process works if you simply want an email address. 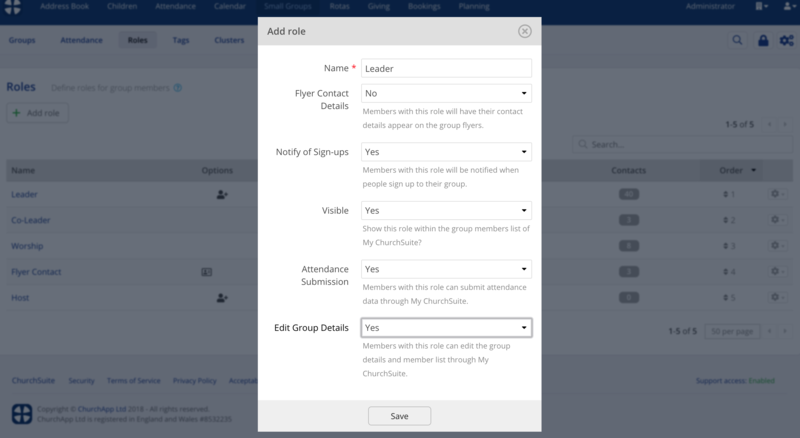 Small group members assigned with this role setting enabled will be notified when people sign-up to their group through My ChurchSuite or the Embed/Connect group pages. This can be a really useful, especially during a sign-up period, as it enables small group leaders to stay on top of who's joining their groups, helping them be intentional about welcoming newcomers. Often churches will run a sign-up period that begins prior to the small group's start date. While small group members with this "Notify of Sign-Ups" option enabled will receive email notifications of new sign-ups, they will only be able see the list of group members in My Groups if the "Enable attendance submission" option is checked in the Small Group Module settings for My ChurchSuite. (Go to Small Groups > Module Settings > My ChurchSuite and "Enable attendance submission"). Enabling the "Visible" role option will show this role against the member's name in the My Groups member list within My ChurchSuite. This will mean that group members, or those that sign-up to that group through My ChurchSuite (if you have 'make member list immediately available' selected within the Group's sign-up options) will be able to easily see the assigned roles of their fellow group members. This can be really useful for newcomers to identify the group leaders. However, in some churches or groups, role invisibility may be more preferable; in which case, simply disable the "Visible" role option. Small group members assigned with this role permission can submit group attendance through My ChurchSuite. For this to function, attendance submission must be enabled globally in the Small Group module's "My ChurchSuite" options. 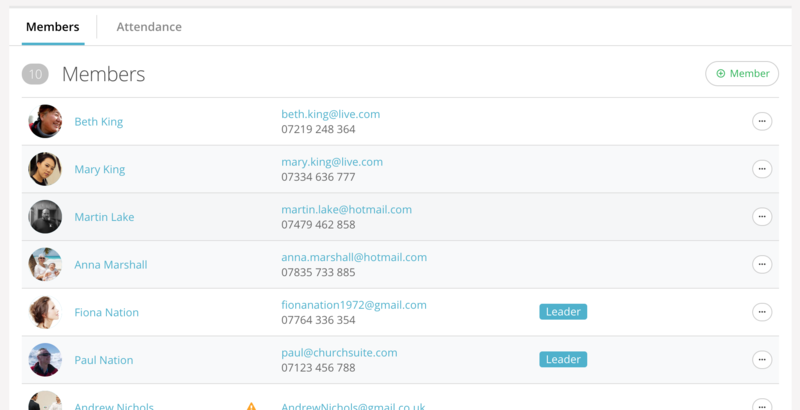 Attendance recorded through My ChurchSuite is added to the Attendance section within your Small Groups module. 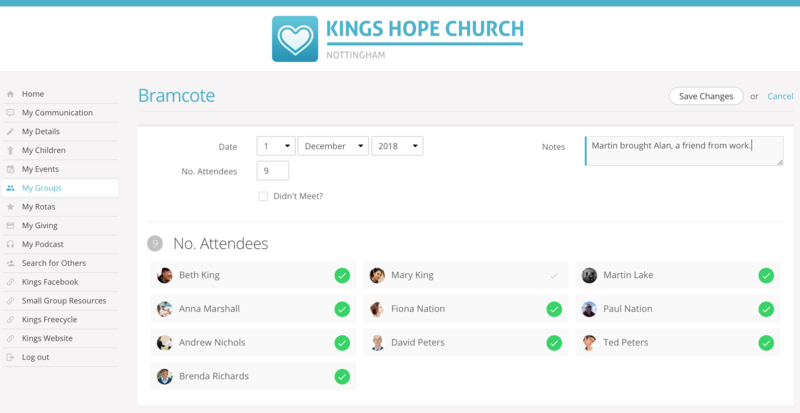 Attendance recording is helpful to both pastors and leaders as they monitor small group engagement, to see which groups have available capacity to direct newcomers to, to quickly spot pastoral issues where a member is seemingly withdrawing from small group community, but importantly for maintain a register for safeguarding purposes. Small group members with this role option enabled, will see an Add attendance button on their My Groups page within My ChurchSuite. From there they can simply tick all of those who were present, or use the notes field to record any visitor information, or even record if the group didn't meet. Attendance submitters will also be able to see an 'Attendance' tab in My Groups, giving a simple summary of recent group attendance - really helpful for spotting who's not been for a while. See our related articles on small group attendance recording. Small group members assigned with this role permission will be able to access an Edit Details section in My Groups within My ChurchSuite. 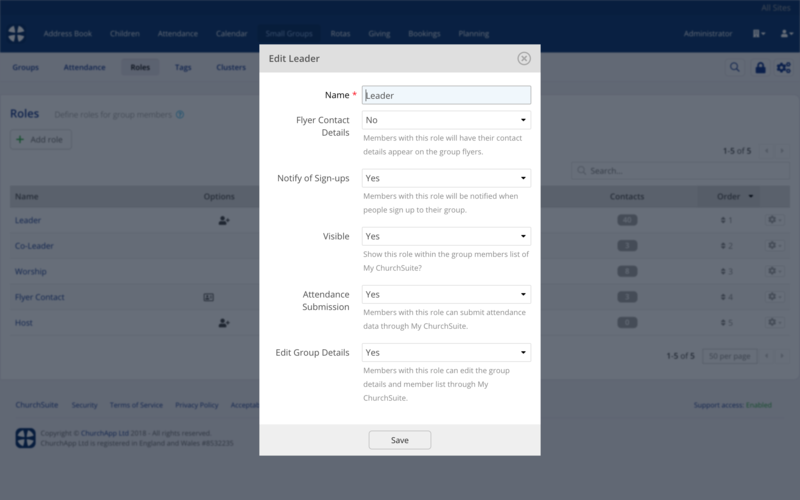 This functionality also allows role holders to manage their group Members list, including being able to add/remove members from the group, assign roles, and set active (approve) 'pending status' sign-ups. The precise details of what group fields can be edited by these role holders is set in the small group module's settings, as this is global setting across all small groups. Go to "Small Groups" > Module options (by clicking on the admin cog in the top right hand corner of page). From there click on the "My ChurchSuite" options and scroll down to the Editable Fields section. Once you have set which fields are editable by those with Edit Group Details permissions enabled, role holders will be able to click the Edit [group] button and make any necessary changes. 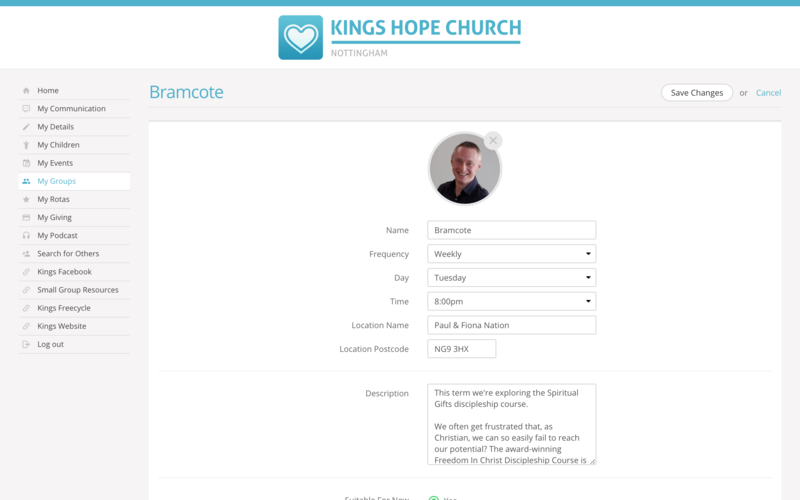 All changes will be added back to the Group's page in your ChurchSuite Small Groups module. Whether it's issuing an invitation to small group leaders to attend an end of year party, or linking resources to small group junior leaders, or sending the chord music to this month's latest worship song to your small group worship leaders - "Roles" makes the task of targeted communications super easy. Here we outline two useful ways to communicate by role. First, head to the Roles section of your Small Groups module. Click through to the role that you wish to communicate with. Note the option to filter (and therefore communicate with) role holders of archived, active and future groups. Click Update to apply a filtered selection. Click Communicate to send an email or SMS to all the small group members assigned with that role. 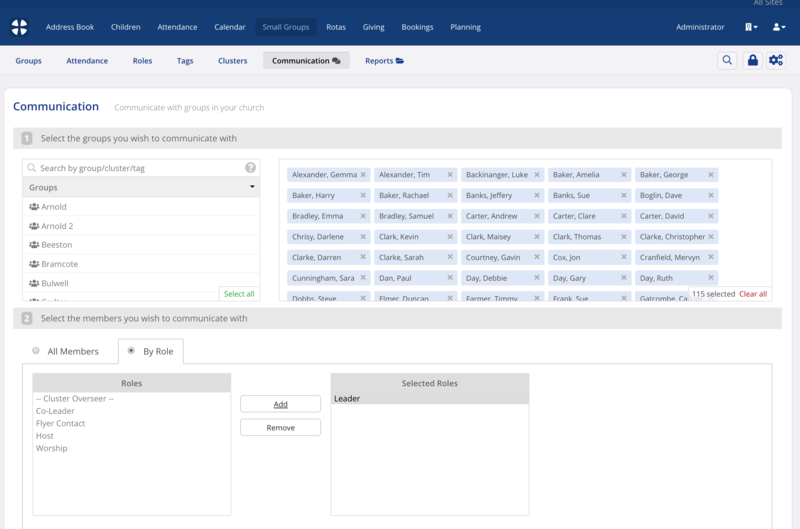 Alternatively, within the Small Groups > Communication section, you have the option to communicate to All Members of a group(s), or By Role. This method will only send to active role holders.